On June 9, 2014, I attended a program at The Brookings Institution with my colleagues Laurel Fritzsch and Lemelson Center fellow Matt Wisnioski. The program marked the release of a new report entitled “The Rise of Innovation Districts: A New Geography of Innovation in America,” developed by Bruce Katz, Vice President and Co-Director of Brookings’ Metropolitan Policy Program (MPP), and Julie Wagner, a non-resident senior fellow with MPP. The report and accompanying program provided a present-day and more policy-oriented perspective on many of the issues the Lemelson Center is exploring through Places of Invention, our exhibition (and accompanying book) set to open in Summer 2015. “The Rise of Innovation Districts” is a new report developed by Bruce Katz and Julie Wagner of the Brookings’s Institution’s Metropolitan Policy Program. Courtesy of the Brookings Institution. In their report, Katz and Wagner trace what they call “a remarkable shift…in the spatial geography of innovation” away from the suburbs and back to cities. As documented by historians like Bill Leslie and Scott Knowles, many high-tech firms moved to the suburbs in the years after World War II where they built sprawling, space-age corporate campuses and R&D facilities. Some of the best known examples include the General Motors’ Technical Center (Warren, MI, in 1956), IBM’s Thomas Watson Research Center (Yorktown Heights, NY, in 1961), and AT&T’s Bell Laboratories (Holmdel, NJ, in 1962). The thinking at that time was to isolate industrial scientists from the suits and bean-counters at headquarters (and from other competitors) by plopping them in an idyllic university-like setting where they could invent new cutting-edge technologies. In 1962, AT&T opened a sprawling 472-acre campus for Bell Labs in suburban Holmdel, NJ. It was designed by modernist architect Eero Saarinen, who created similar suburban campuses for General Motors (Warren, MI) and IBM (Yorktown Heights, NY). Photo courtesy of user MBisanz on Wikimedia Commons. These districts, by our definition, are geographic areas where leading-edge anchor institutions and companies cluster and connect with start-ups, business incubators and accelerators. They are also physically compact, transit-accessible, and technically-wired and offer mixed-use housing, office, and retail. In contrast to the post-war suburban campuses, think Kendall Square in Cambridge, MA; University City in West Philadelphia, PA; and South Lake Union district in Seattle, WA. These urban districts feature big research universities (MIT, Univ. of Pennsylvania, Drexel) and big high-tech firms (Amazon, Microsoft) that serve as anchors for attracting additional high-tech startups, plus the housing and complimentary retail businesses that support them. As Bruce Katz argues in this short video, innovation is increasingly taking place where people come together, not in isolated spaces. Courtesy of the Brookings Institution, via YouTube. Katz and Wagner explain some of the reasons for this geographic shift back to cities. First, in terms of demographics, married families with children—the residents most likely to enjoy the suburbs—now constitute less than 20% of all US households. Young professionals and retired empty-nesters increasingly prefer to live in cities where they can walk to the gym, visit a museum after work, or meet a friend at a coffee shop or tavern. But a more interesting observation concerns the changing nature of innovation strategies and why today’s innovators and entrepreneurs favor the inter-connectedness of cities. During the mid-20th century, the big high-tech firms pursued a linear model of innovation, in which they believed pure scientific research (R) would lead directly to the development (D) of marketable new technologies, all within the confines of the firm’s suburban R&D labs. That strategy worked for a while: for example, researchers at Bell Labs developed transistors and lasers while earning 11 Nobel Prizes. But Bell Labs would eventually fall victim to the “campus curse” as the isolation and insularism of its pristine suburban labs slowed the pace of innovation. 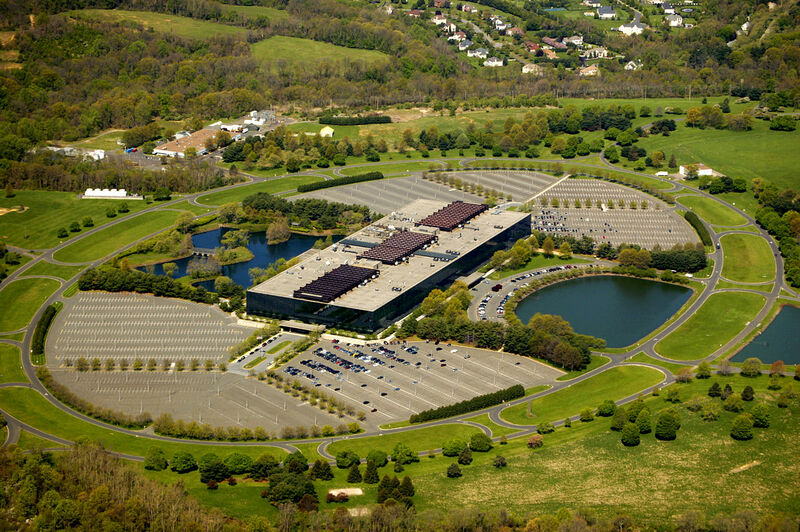 In fact, AT&T sold off Bell Labs to Alcatel-Lucent in 1996, and the famous Holmdel, NJ, laboratories, designed by modernist architect Eero Saarinen, now sit empty. It may be converted into a medical center…or razed. Instead, most small and medium-sized businesses are increasingly turning toward an “open innovation” strategy, in which they develop some of their own in-house technologies, while also partnering with other firms to buy or license certain new inventions. As Katz noted in his talk, this mixed, open innovation strategy “craves proximity” and “extols integration” in order to make the necessary connections. So in terms of geography, it makes more sense to locate a startup in an urban innovation district where the density of development increases the odds of finding new ideas and technology partners—at the “incubator” next door or in a serendipitous exchange at the corner coffee shop. 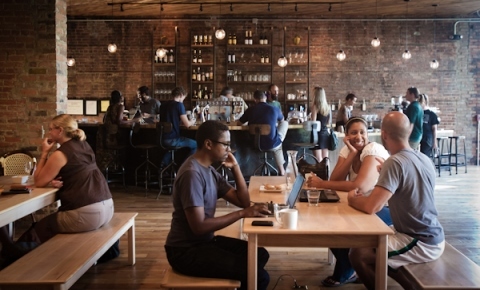 Coffee shops (like Detroit’s Great Lakes Coffee) are now places for entrepreneurs to work and network. Photo credit: Marvin Shaouni, originally published in Model D, and featured in the Brookings report. As Katz and Wagner note in their full report, these 21st century innovation districts are in many ways a return to the original 19th and 20th century industrial districts that flourished in the first wave of industrialization. In these districts, firms from the same industry would cluster in a city neighborhood as workers walked to work and patronized local businesses. We see this clearly in some of our Places of Invention exhibition case studies. 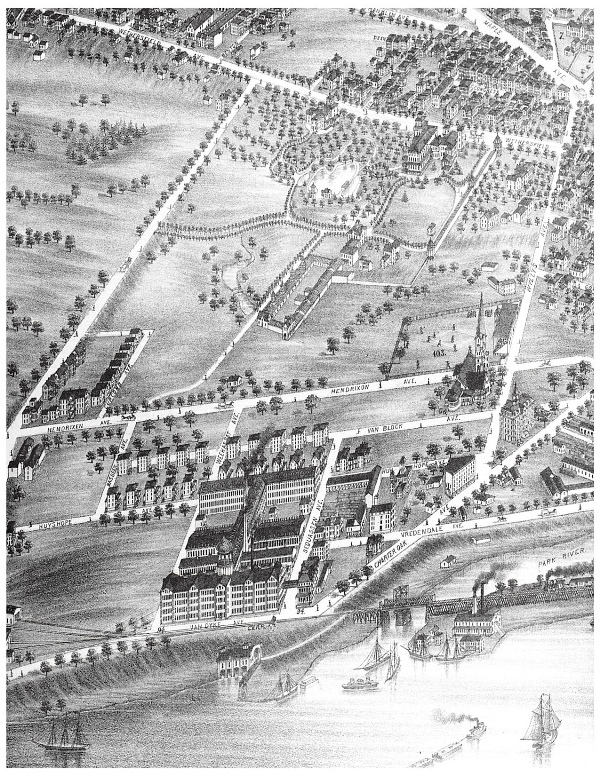 For example in 19th-century Hartford, skilled machinists in the Coltsville neighborhood lived in company-built housing and walked a few hundred yards to Samuel Colt’s famous armory where they mass produced revolvers with interchangeable parts. After their shift, they might walk next door to Charter Oak Hall to practice with the Colt Armory band, take in an evening lecture, or use the lending library while mingling with fellow workers. To use Katz and Wagner’s language, the Colt Armory was the “anchor firm” of the Hartford “innovation district,” which grew to include the Weed Sewing Machine Co., the Pope Manufacturing Co. (bicycles, automobiles), both the Underwood and Royal Typewriter companies, and Pratt &Whitney (machines tools), the last of which was a spin-off founded by two former Colt machinists. Similarly, in the 1950s several medical device firms clustered around two Twin Cities anchors—the University of Minnesota’s Variety Club Heart Hospital and Medtronic—in “Medical Alley” Minnesota. A bird’s-eye view of “Coltsville,” 1877. This industrial village along the Connecticut River in Hartford included Samuel Colt’s famous onion-domed factory (foreground), and behind it, workers’ housing, a baseball field, and a church. To the right of the armory and below the church is Charter Oak Hall, where workers could engage in numerous leisure activities. A detail from the lithograph “City of Hartford” (1877) by O. H. Bailey, courtesy of The Connecticut Historical Society. Katz and Warner believe there is strong potential for the growth of innovation districts in several US cities. Indeed, as new urban innovation districts emerge in cities like St. Louis, Detroit, and Boston, civic leaders would be wise to brush up on their history to learn lessons from earlier Places of Invention. Godin, Benoit. "The Linear Model of Innovation: The Historical Construction of an Analytical Framework.” Science, Technology & Human Values 31 (2006): 639–667. Katz, Bruce and Julie Wagner. 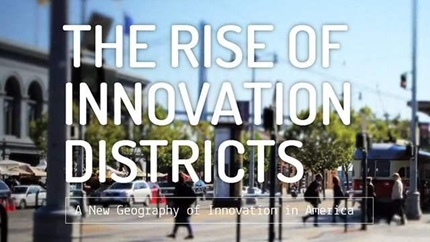 The Rise of Innovation Districts: A New Geography of Innovation in America. Washington, DC: Brookings Institution, 2014. Accessed 19 June 2014. Leslie, Stuart W. and Scott Knowles. “Industrial Versailles: Eero Saarinen’s Corporate Campuses for GM, IBM, and AT&T,” Isis 92, no. 1 (March 2001): 1-33. Rigby, Bill and Alistair Barr. “Will Apple, Google, Facebook, and Amazon fall victim to the ‘campus curse?’” San Jose Mercury News, 28 May 2013. Accessed 19 June 2014.